Have you ever dreamed of zipping through the air like a trapeze artist or trying your skills at tight rope walking? Well, dream no more as you now have the chance to try this out for yourself in a very safe manner, surrounded by nature and at a very reasonable price too! Zip Borneo is a company that specialises in adventure, team building and personnel development courses by incorporating the facilities at their adventure center situated just under an hours drive from the city of Kota Kinabalu, in the beautiful valleys of the Crocker range. Located on a grassy field bordering the Kuilu River and surrounded by local farms and secondary forest, it’s the ideal base camp for many of their activities such as corporate team building, jungle survival and personal development courses. Courses where you learn to challenge your self -imposed boundaries and find new strengths. Alex and Floyd the Zip Line Managers. About 2 years ago 2013 they decided to set up an 18m tall tower for abseiling, wall climbing, rope course and a Zip line. Constructed from Metal and wood it is the main nerve centre for most of the challenges. Two of the tower sides are covered in wooden planks and used for abseiling and wall/rock climbing, while 2 platforms built into the tower at heights of 16m and 18m are used as the starting points for the rope challenges and also the Zip-line ride. Upon arrival at the center you will be briefed on the various activities and also the safety aspects. Safety as one can imagine is of the utmost importance when comes to such activities. The instructors have all undergone rigorous and strict training and the equipment is built and maintained in line with safety standards set by the Association of Canopy/zip line course technology. Following the briefing you will be fitted with a harness, safety helmet and suitable footwear. (In case you came in your high heels). Your body weight has to be less than 120kg and you have to be over 10 years of age. 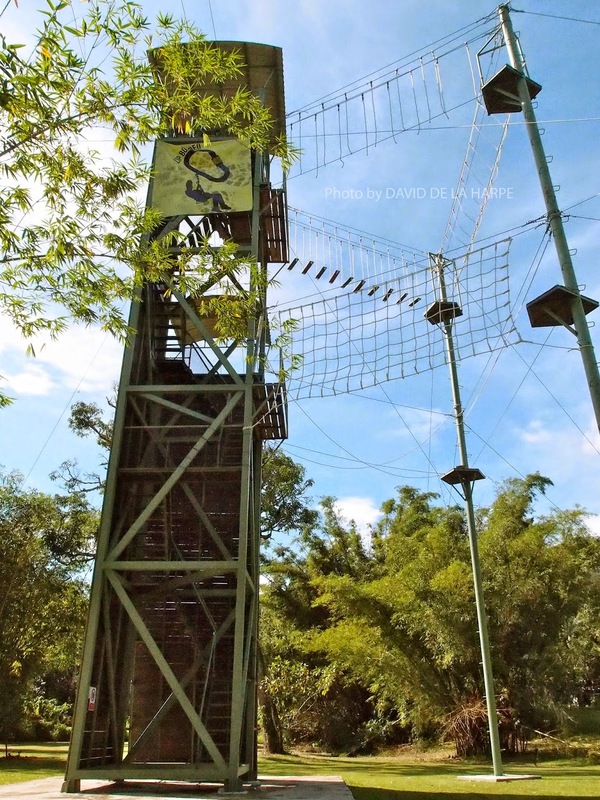 For those of you with a sense of adventure and who like both mental and physical challenges, I would recommend that you take the full package which would include the Zip line and rope challenges. Once you’re all geared out, its time to make your way to the tower and climb the metal steps to the platform for the rope challenges. Before your start you will be secured to the main cables with 2 sets of safety cables for the various challenges. Some of them are pretty easy as you walk along on a single steel cable suspended either 16 or 18 meters above the ground, while others vibrate and sway and no matter how much you try to steady you legs, the cables move with a life of their own .For some, climbing across the cargo net is “a piece of cake” while for others stepping on the wooden boards suspended from cables in mid air is not that easy after all. I personally found the single-cable crossing with the 2 loose guide ropes the hardest to navigate. 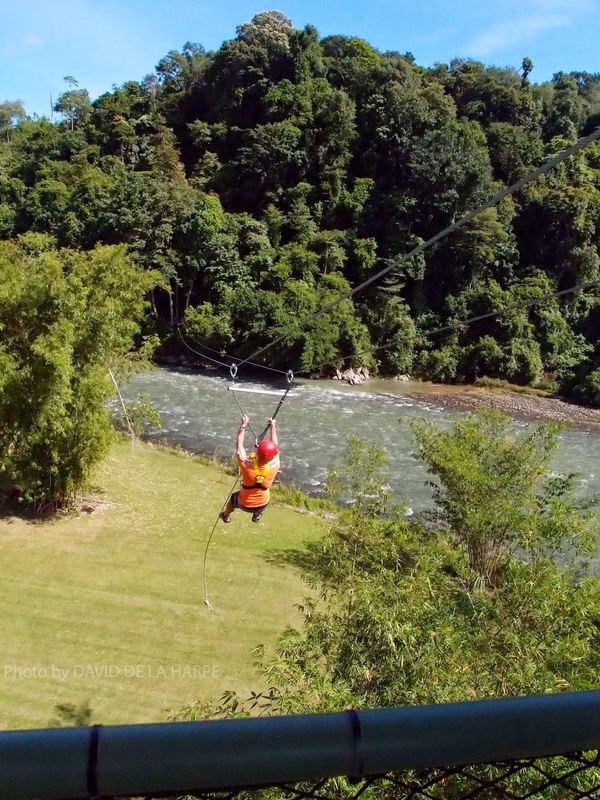 The finale for the trip would be the exhilarating ride across the Kiulu River on the longest Zip-line in Borneo. This zip-line is 320meters long and built in 2 parts which gives you double the fun. The first section of the ride takes you from the 18m platform on the tower across to the opposite side of the river and then you attach yourself to the second line and come back across the river. 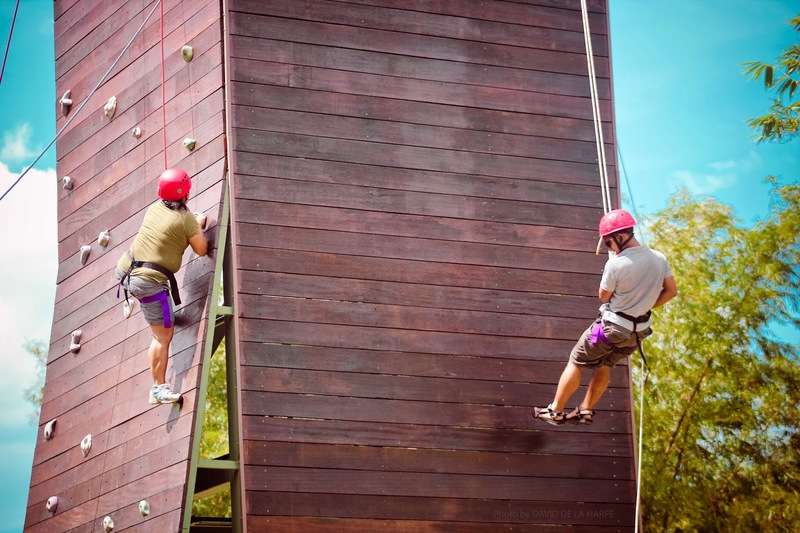 There are various packages available from just the Zip-line, or including the rope challenges, or taking a full day package with White water rafting, abseiling and wall climbing thrown in. 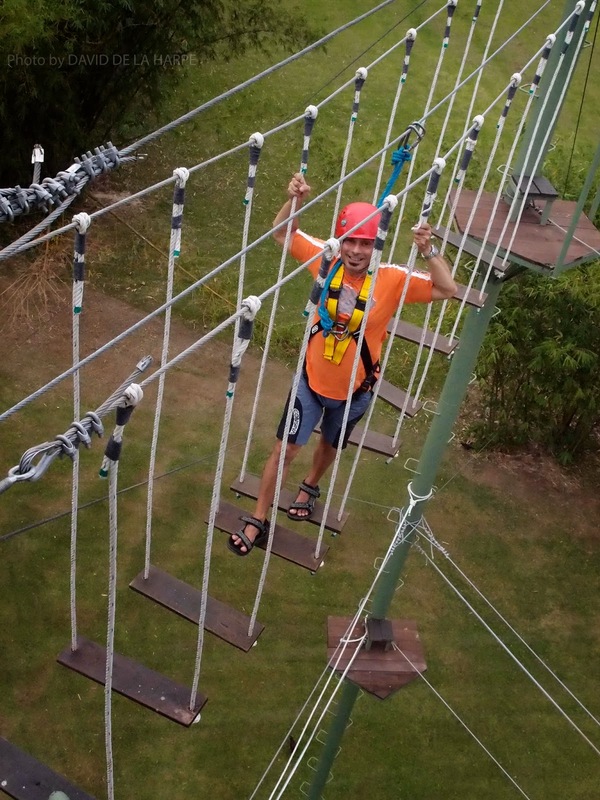 Prices start from RM40.00 for a single Zip ride to RM280 for a full day package with lunch.